When you walk down Shimon Bar Yochai Street you will come across one of Safed's hidden treasures: a beautiful little garden. Almost next door to David Friedman's gallery, this garden is a lovely spot to stop and relax and even picnic. Planted in bare soil in 1996 as a memorial garden, it is now lush and green throughout the year. Steven Eric Levine was born on May 6th 1968 and died on June 15th 1994 from cancer. He was a tender, loving supportive son and brother who packed more into his 26 years than many people do in a lifetime. Before getting sick he was a successful stock-broker and had all the material accruements of a 90's yuppie. He was blessed with good looks, friends, accomplishments, and a loving relationship. A risk taker, he loved traveling and living life to the fullest - in the fast lane. When Steven got sick, his devoted mother Shirel, a spiritual seeker, began looking towards her Jewish heritage to give her insight and comfort. Eight months after he passed away, she was encouraged to take a trip to Israel, a gift Steven had promised her. At the end of the short trip, apprehensive about returning home, she decided to remain in Israel to continue her learning and spiritual search in Safed. Coming to Safed, the grief stricken Shirel was embraced and comforted by the community who tried to answer her spiritual needs. Shirel wanted to plant a tree for Steven, but a tree she could look after, not an anonymous tree in a forest. Unable to find somewhere to plant one, Shirel settled on a tiny ‘tree in a box' she had received as a gift. Friendly with a newly married couple, Noach and Tamar Bittelman who were living in Safed, she showed Tamar the directions on the tree box. Tamar, who had gardening experience said, "Have you ever thought of planting a garden?" Tamar knew of an unused piece of land next to the children's English library where they could create a garden. Shirel and the Bittelman's approached Avi Ben Zev about using the land in front of the Children's Library. The land in front of and next door had in fact once been a house that burned down many years ago and the city razed it because of the danger involved. In the beginning the water was provided by the Children's library until it closed and the Ben Zev's had to move to Jerusalem. Although the soil was so poor not even weeds grew, on May 6th 1996, on what would have been Steven's 28th birthday, they had a commemorative opening dig of Steven's Garden. Noach dug three beds for plants and young Shira Friedman planted the first tree - a puny little almond tree. There was music, refreshments and a celebration of Steven's life. Tamar organized and led weekly activities to teach children organic gardening and Steven's garden slowly took shape. Gradually the garden began to grow and Allison and Shmuel Ofanansky took over the day to day care of the garden after the Bittelmans moved back to America. Livnot U'Lehibanot students painted a mural from ideas given to them by Jamie, Steven's sister. With the financial support of the Levine family and yearly contributions from their friends in America, the garden has continued to flourish. 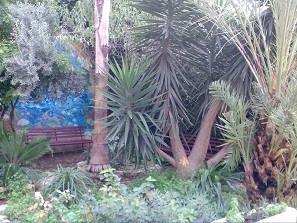 Gradually, over the years, the garden has become a more manicured, perennial environmental garden, and is an example for other community gardens in Safed. People feel a spiritual calm when they visit the garden, maybe because the garden is a labor of love. Despite living in Jerusalem, Shirel continues to visit Safed, her spiritual home, regularly, oversees improvements in the garden and feels her son's presence in this special space. Steven's Garden devotes an area to recycling and composting in an effort to help create environmental awareness in the community. The garden is now a lush green oasis, and the beauty of the garden is a wonderful living memorial to Steven, whose life was so tragically cut short.